OVERVIEW: The technical breakdown in the indices that began on Thursday continued on Friday with the tech sector again taking the brunt of the selling. The only good news was that volume receded somewhat from Thursdays turnover, but this is not much solace as plenty of distribution days can be found, particularly in the small cap and tech area. The Russell 2000 and S&P 500 ETF have come down to some possible support areas, but caution remains the word of the day as some of the underpinnings in the market continue to flash some warning signs including a narrowing of market leadership, as evidenced by the contraction of new highs versus new lows, recent mounting distribution and the breaking of the 50 day lines. We don’t know what kind of correction may be in store, or if another quick buy the dip turn around in this bull market is in store, but the lowering of risk at the present is supported by what we have been seeing in the indices and individual leading stocks. Let’s take our weekly look a the index charts to gain some perspective. SPY- The ETF we use here to track the S&P 500 has definitely behaved better than the Nasdaq and Russell 2000, but it also has finally succumbed to the selling pressure. While still in a longer term uptrend, evidenced by the pretty channel the ETF has carved out, this weeks late selling has quickly brought the ETF down to an area of bi-lateral support at the 50 day EMA as well as the previous breakout support level near 286. If this area on the chart does not hold up, we can look to the six month uptrend line as the next area of support. Beyond this, the July breakout area around $280 could be the next line of defense and this would represent just about a 5% decline from the September all-time high. While this is not a large correction in the general scheme of things, a lot of damage can be done to a traders account in the interim if one is not managing the current market risks properly. NASDAQ- The Nasdaq Composite broke a tri-lateral area of support on Thursday on extremely heavy turnover and that selling followed thru on Friday with the index losing an additional 1.16%. 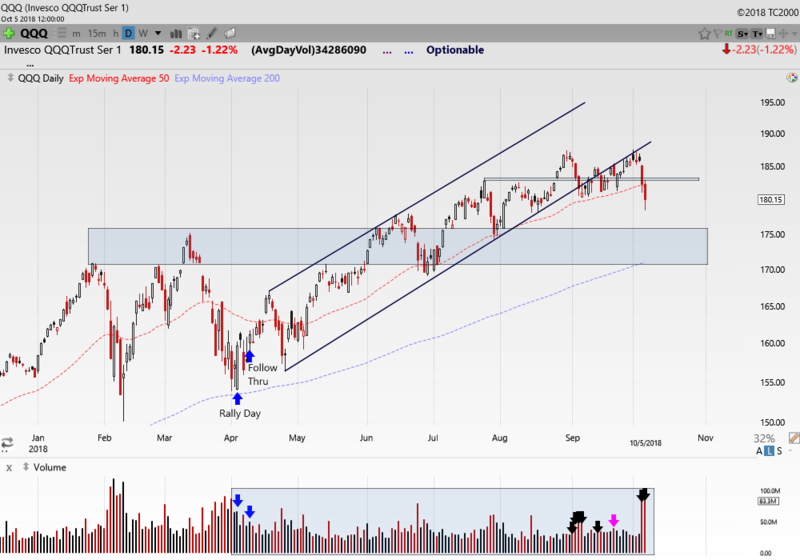 We now have seven distribution days on the books for the index which is more than enough over the last 25 sessions, when coupled with the aforementioned technical violations, to warrant caution. The index reached a 5% correction from the September high during Fridays session and we can now look to 7640 as the next area of possible support should the index continue its decline. 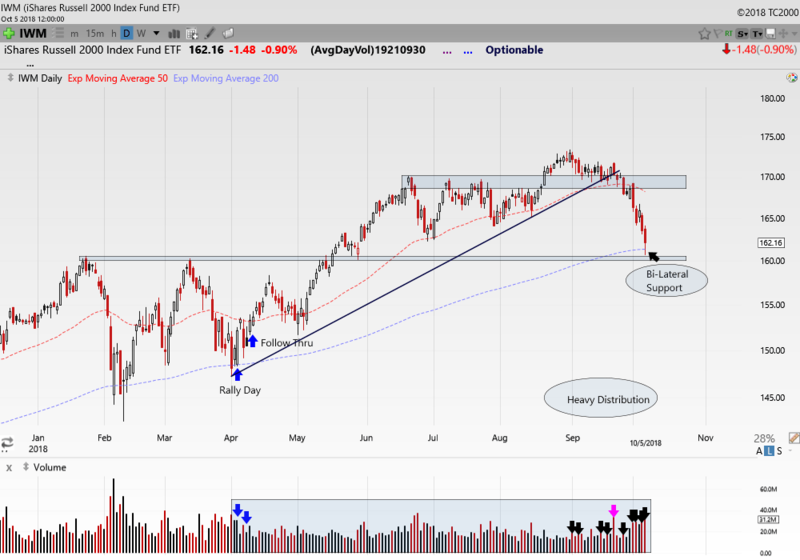 Look for the 50 day EMA and the shaded area near 7950 to provide some possible resistance on any rally attempt. The tech area continues to be a high risk area of the market heading into next week, even on a snap back rally, so we suggest continued caution and some patience here before getting too involved. QQQ- The Nasdaq 100s violation of support was similar to that of the Composite, but it was the only index to rack up a distribution day on Friday as volume continues to swell. 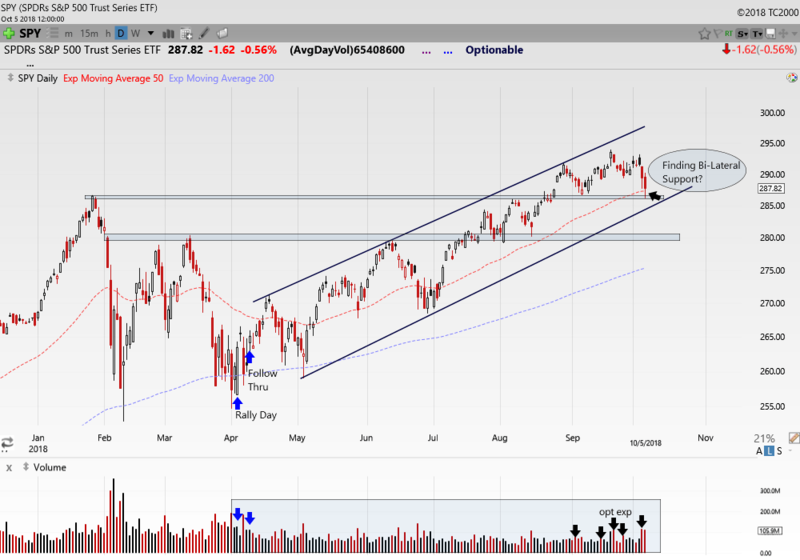 We have not seen back to back volume days of this magnitude here since February of this year when the index had bottomed and distribution days now sit at an elevated level of eight over the last 25 session period. We can look to the 175-176 area as the next line of possible support and the 182-183 area shade on the chart as possible resistance on any advance. IWM- The Russell 2000 ETFs decline was well out in front of the other indices, just as it was on the breakout to new highs back in the spring. 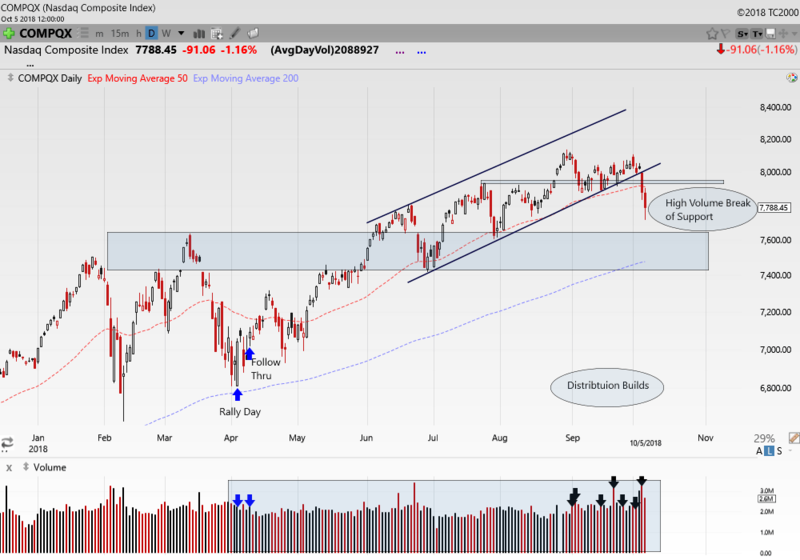 The decline here from the top in late August is now over 7% but the possible good news here is that index caught at a bi-lateral area of support Friday afternoon at the 200 day EMA as well as the previous breakout level back in May near $160. This spot may provide the impetus for a sharp snap back rally early next week, but beyond that things are still in question as the index has accumulated a whopping 10 distribution days since the calendar hit September. Join us at http://www.ttptrading.com for complete premium member access that includes real-time stock and option alerts along with nightly trading recaps of indices and individual positions, weekend watchlist videos, sector reviews and more, See you there!